In this section you’ll find ways that you may not have considered to connect with other stakeholders in the community. By expanding beyond your usual arena, word gets out about the great work your organization does and you may discover ways to collaborate. 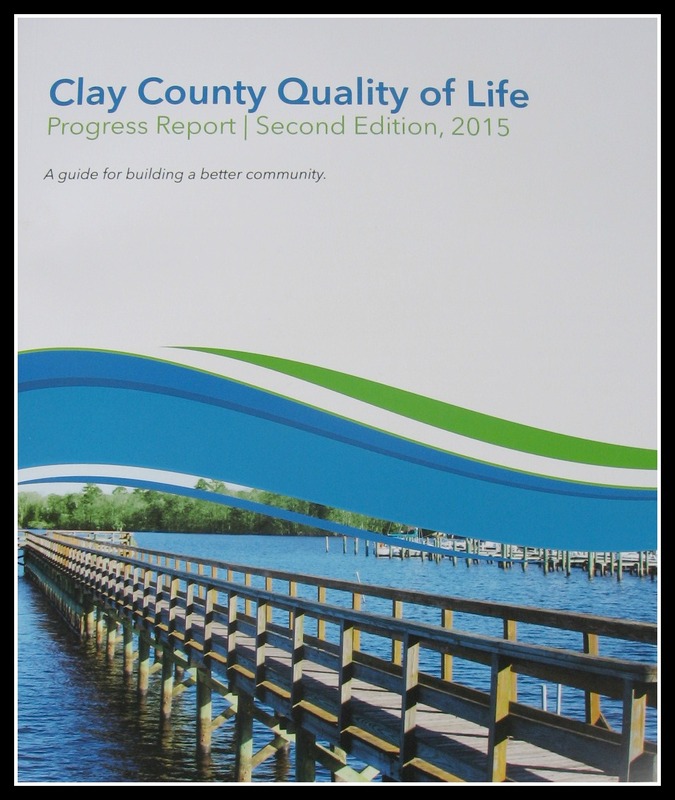 Clay County Quality of Life Report The newly released 2015 Second Edition, which updates the 2008 First Edition, is a guide for building a better community. Everyone is encouraged to read it as it provides a high-level review of where we stand in the 10 areas of: Arts & Culture, Economy, Education, Health, Public Safety, Recreation, Environment, Governance, Social Well-Being, and Transportation. 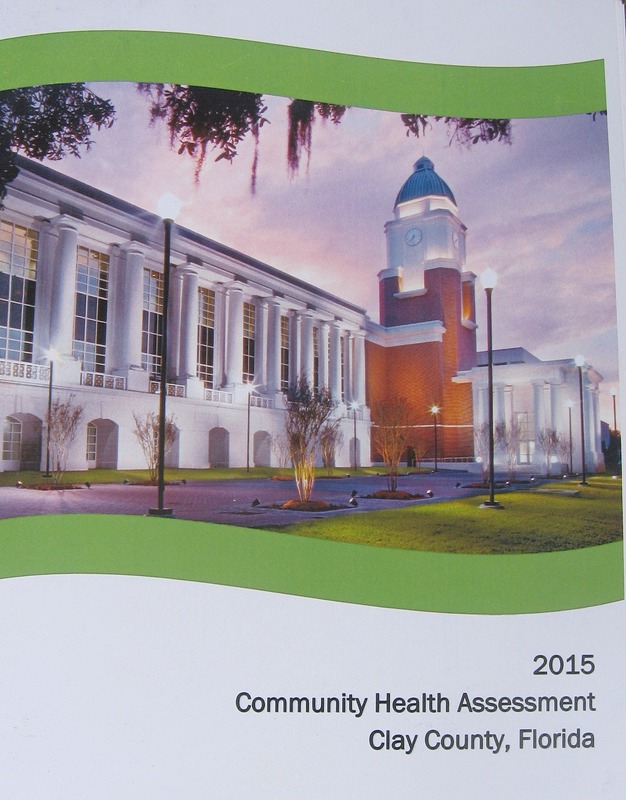 You can obtain a hard copy at the Clay County Chamber office, or click here. http://www.claytodayonline.com/stories/clay-county-quality-of-life-progroess-report,357. 5-Year Economic Development Plan outlines Clay County’s economic development future which recommends that county officials maximize the First Coast Expressway construction, institute high visibility entrepreneurial support, support manufacturing, marine and aviation industries, implement placemaking which builds on our distinct amenities, and increase our entire community’s focus on economic development. This graph comes from Balmoral Group’s New 5-year Economic Development Plan Strategies and Recommendations Report. 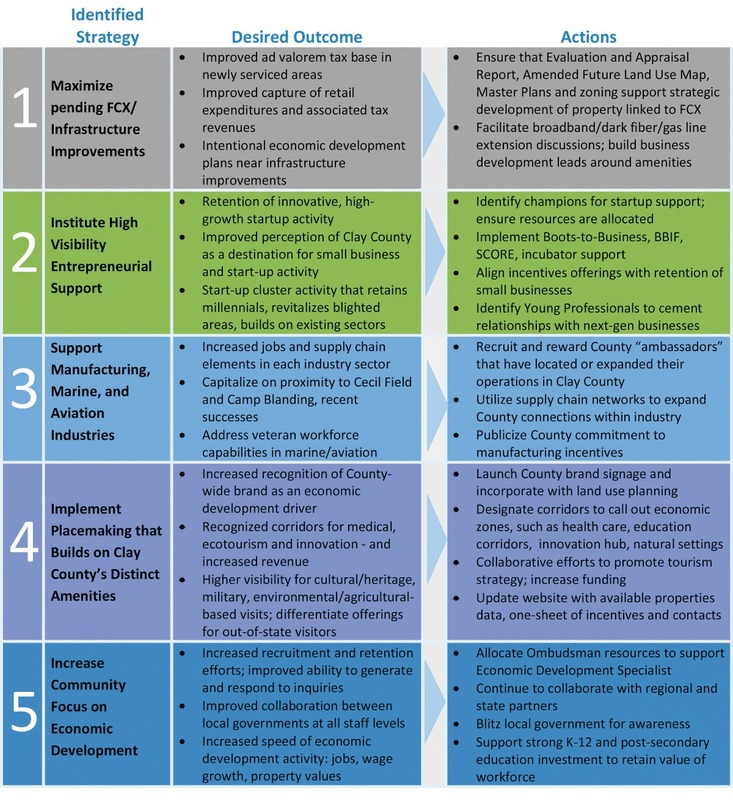 It shows the five strategies that will be the focus of the Economic Development Corporation and other Clay County entities over the next five years. 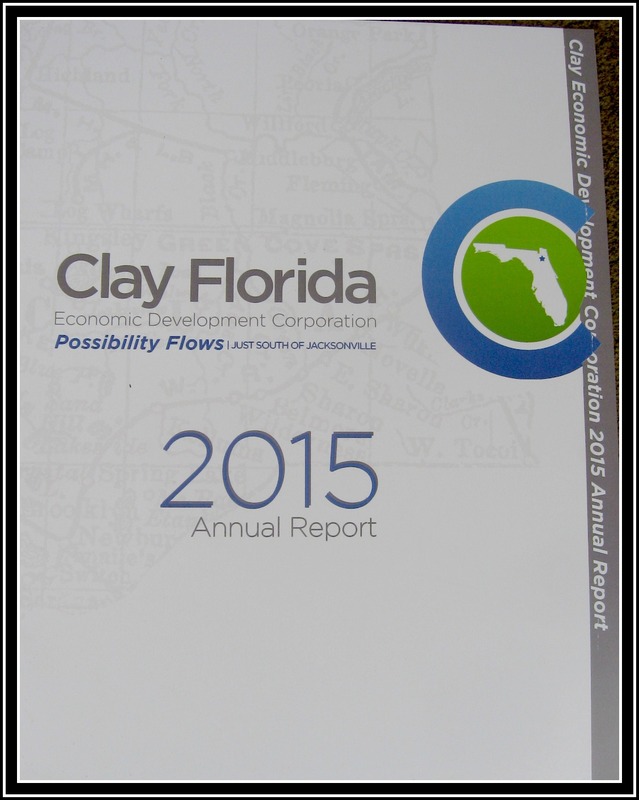 A major goal of the plan is to develop ways to attract higher wage jobs into Clay County. Presently sixty percent of our residents drive out of the county to work. Review the strategies, desired outcomes, and actions to see where your organization can plug into this plan. How will the outcomes affect your organization? What impact will more businesses and homes have on your organization? What role can your organization take on in implementing this plan? 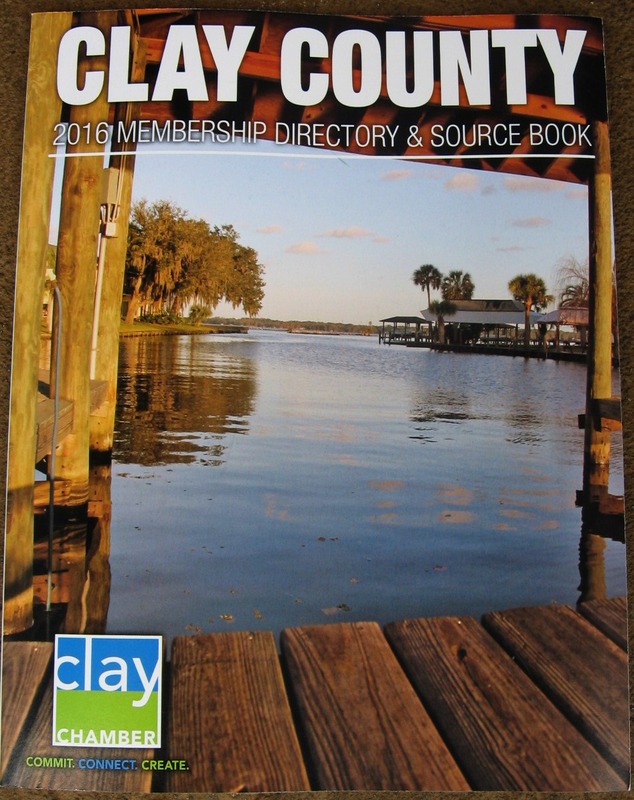 Clay County Chamber of Commerce Become a member of the Clay County Chamber and your organization will be in this Membership Directory and Source Book next year. Our Clay County Chamber has membership for all levels of businesses that operate in our community, including nonprofits. Stop by the Clay County Chamber office and pick up a copy and find out about becoming a member. 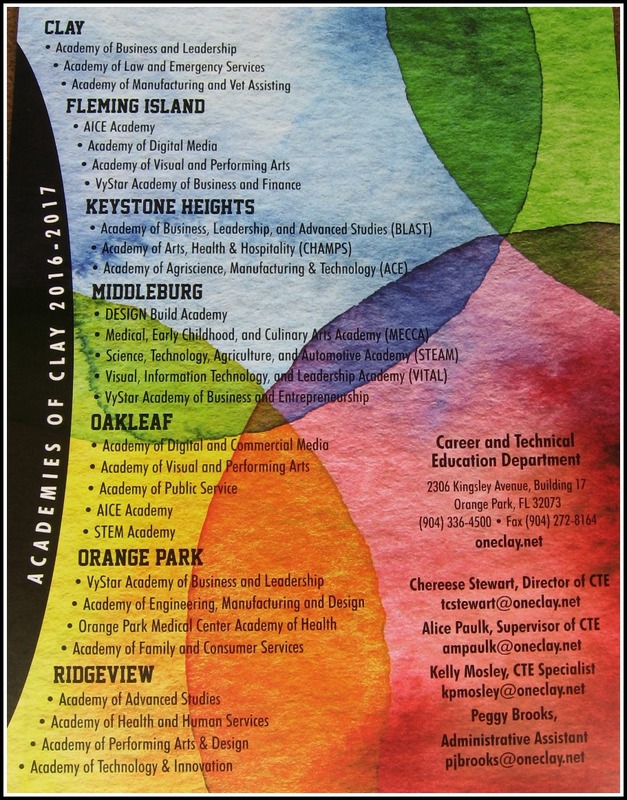 Academies of Clay County are areas of study for high schools students in our county. The Clay County School District’s Career and Technical Education Department wants to connect business partners with the schools. Do you want to help students achieve academic excellence? Do you want to have an impact on economic development within our county? This is your opportunity to become involved in molding future employees and citizens in our community. Contact the Career and Technical Education Department to find out how you can get involved with the Academies of Clay. Students in the program have opportunities to work closely with businesses and have a firsthand understanding of the career in which they are interested. They will be better prepared to enter the workforce and contribute to their new organization. Business Partners work closely with the CTE Department giving students the chance to network with professionals, job shadow, intern, undergo mock interviews, etc. Find an academy near your organization which you can support. Connect with the CTE Department. You’ll be giving students the opportunity to experience the skills they need to develop in order to succeed in business, either in for profit or nonprofit organizations.